TrackMyWork is a time tracker especially for employees for collecting your working hours. You can check in and out per day as often as you want. 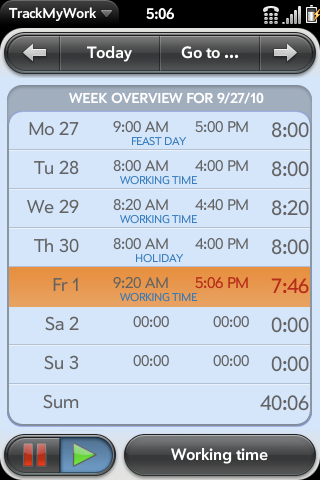 The working time gets summarized per day and week. Entries can also be added, altered and deleted manually. Different categories (for example working time, free time, holidays, etc.) can also be assigned, as well as a short description per entry. Night shifts are supported. Data can be imported and exported.